Blood clots affect up to 900,000 people in the United States each year. 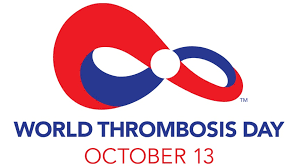 World Thrombosis Day (WTD), observed on October 13, places a global spotlight on thrombosis (the medical term for blood clots) as an urgent and growing health problem. This year’s WTD focused on healthcare-associated blood clots, which is a leading cause of preventable hospital death in the United States, and costs up to $5 billion per year. In honor of WTD, the National Center on Birth Defects and Developmental Disabilities (NCBDDD) created new web pages focused on blood clots and healthcare-associated blood clots, full of new free resources including fact sheets, infographics, eCards, and more. In addition, on October 13, 2015, @CDC_NCBDDD participated in a WTD Twitter chat hosted by the International Society on Thrombosis and Haemostasis (ISTH). Following at 2pm that same day, NCBDDD and ISTH cohosted a webinar featuring Dr. Andra James on the prevention and treatment of blood clots during pregnancy. We have also been tweeting about blood clots via @CDC_NCBDDD throughout the month of October. Sign into Twitter and join the conversation about blood clots and how to prevent them!